It's not often you see such an exquisite piece of Australian automotive history for sale, but thats what we are seeing right now on eBay. A genuine Type 65 Norman super charger is for sale on eBay with a starting bid of $5500. It's missing a few bits buts it's a fine piece of speed equipment. I have seen some pictures ( I will try dig them up ) of a perfect condition and complete Type 65 that sold 5 years ago for $8500. It was by an unknown buyer and many people thought it was a fake bit, but it wasn't it was real and the cash changed hands. This goes to show the price is what someone is willing to pay at the time. 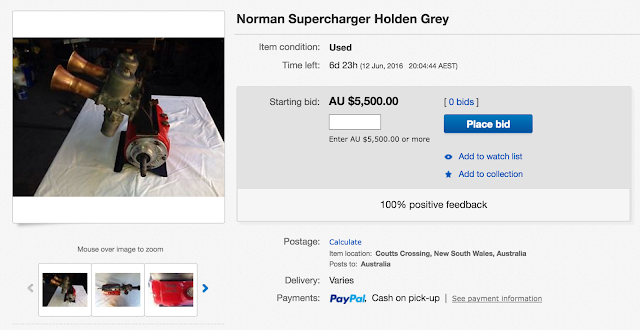 I have personally seen very few Norman super chargers change hands ( only 2 Type 65s ) and they are never cheap. They are period correct for the Holden grey motor.